Champion Hes Relentless is the #1 first-crop sire of money earners for 2019. DALLAS, TX—MARCH 15, 2019—Official 2-year-old races got underway three weeks ago and a number first-crop sires have not only sired their the first winner(s), but four have already gotten their first stakes qualifiers. Louisiana-based stallions got a one-week head start on AQHA's March 1st official 2-year-old starts, due to the Mardi Gras Futurity trials contested February 23 at Louisiana Downs. Champion Apollitical Blood, a Louisiana-based son of leading sire Apollitical Jess standing at Robicheaux Ranch in Breaux Bridge, Louisiana, has sired three winners from nine starters. Among his first three winners are two stakes qualifiers. Trump My Record, an Apollitical Blood colt out of Breck N Records by Pyc Paint Your Wagon, posted the fastest qualifying time for the Grade 3 $254,070 Harrah's Entertainment Futurity at Louisiana Downs. Owned by Cruz Nava and bred by Fulton Quien Sabe Ranches LP, the bay colt is expected to make his next start in the March 20th final. Champion Apollitical Blood is the #1 first-crop sire of winners, with three from six starters, in 2019. Escandalo, a daughter of Apollitical Blood from the Mr Jess Perry mare Eying Miss Perry, broke her maiden in the $305,296 Mardi Gras Futurity(RG2) trials on February 23. Racing for owner-breeder Delifino Lozano IV, Escandalo posted the fifth fastest time. The finals will be contested on Saturday (March 16). Apollitical Blood's other winner Rf Apolliticalcookie also broke his maiden in the Mardi Gras Futurity(RG2) trials. The brown gelding races for owner David Gutierrez and was bred in Louisiana by Tim and Jennie Rogers' Rogers Farm. Champion Hes Relentless, who is currently the #1 first-crop sire of money earners, got his first winner March 8th when Ec Revenge posted the fastest qualifying time for the Grade 3 $396,650 Oklahoma Futurity at Remington Park. Out of the Corona Cartel mare Ss Pamilla, Ec Revenge races for owner Elizabeth Logan and was bred by William E. Smith. Hes Relentless stands at Bob Moore Farms in Norman, Oklahoma. 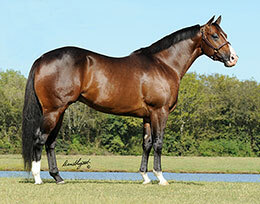 From only six starters Hes Relentless has also sired Oklahoma Futurity qualifier Rrelentless and Df Zookie Cookie. Another 2-year-old, Hes El Martillo posted the 15th fastest time to make the $50,000 Guaranteed Oklahoma Juvenile Invitational. Louisiana-based Heza Fast Rogue has sired two winners from eight starters is the #3 leading first-crop sire though March 12. The son of leading sire Heza Fast Dash, who stands at Tate Farms in Ville Platte, Louisiana, got both his winners, Pk Heza Blazen Rough and Streakin Fast Rogue, in the Mardi Gras Futurity trials February 23. Pk Heza Blazen Rogue is a colt out of the Chicks A Blazin mare Sass That Chick and Streakin Fast Rogues is from the Game Patriot mare Streakin Game Patriot. Seperate Interest got his first winner from two starters and his first stakes qualifier in the Oklahoma Futurity trials with Separate Party, a filly out of the Corona Cartel mare Corona Party Girl. Racing for owner Victory Farms, the gray filly was bred in California by Steve D. Burns, DVM. Seperate Interest stands at Burns Ranch in Menifee, California. Other first crop sires getting their first winners this month is multiple stakes winner One Valiant Hero and All American Juvenile winner JM Specialwynn. One Valiant Hero, a son of leading sire Valiant Hero who stands at Lazy E Ranch got his first winner, Valiant Memorie, in the Oklahoma Futurity trials. A homebred for owner Ed Melzer, from the Pyc Paint Your Wagon mare Painted Memorie posted the 18th fastest time to qualify to the $50,000 Oklahoma Juvenile. He has had five starters. JM Specialwynn's first winner, from two starters, is the filly Vf Brave The Wynd. The filly, out of Brava Brava by Corona Cartel, races for Rockin' J East LLC and is bred by Victory Farms. She posted the 14th fastest time in the Oklahoma Futurity trials to also make the Juvenile. 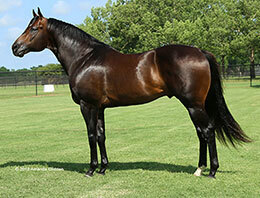 JM Specialwynn, a son of leading sire Walk Thru Fire, is standing at The Quarter Company in Chamberino, New Mexico.